To have hope in times of sadness. Try making a pyramid of cards. Even when they fall down, you hope you can build it into a tower. Do you know any poems? There are many types of poems. Some are silly, some tell a story, some are just pretty. Lamentations is a book of sad poems. Lamentations means crying and talking about all of the sad things that have happened. The form of poetry used is called ACROSTICS. This means you take every letter of the alphabet and start the next line of your peom with that letter. Here is a silly poem I wrote as an example. Always have a tissue handy in case your nose runs. Because if you don’t, it might dribble into your mouth. Causing you to cough your nose dribble everywhere. Eeverywhere you can think of! In the Hebrew alphabet there are 22 letters. Lamentations chapters 1, 2 and 4 have 22 acrostic verses. Chapter 3 has 66 acrostic verses, 3 verses for each letter. Why is the letter so sad? Becasue Jerusalem fell to the Babylonians and the temple was destroyed in AS 587/586. Many of the survivors have been taken into slavery. They had been punished for their sins and the enemy was happy. However, in the middle of the sadness, there are some verses of HOPE. Hope looks beyond sadness. Read Lamentations Chapter 3 v 21-26. The tears of the prophet Jeremiah. 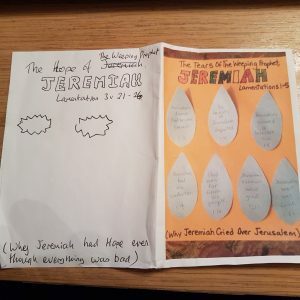 The hope of the prophet Jeremiah. 6. Enemies enjoying seeing the Jews being punished for their sins. On the other side, put on reasons to have hope from Lamentations 3v21-26.